The word lavender - from the Latin lavare meaning wash - dates back to the Middle Ages but in ancient times it was used by the Egyptians, Greeks and Romans to scent the baths. It is the latter that have disseminated this Mediterranean sweet nurse almost all ills, through their empire. Cited by Pliny, who recommends the infusion, it is mentioned by his contemporary Dioscorides in his treatise "De mate ria medica". In the Middle Ages, lavender is present in every garden almost: those monasteries like those rich castles. St. Hildegard (1098- 1179) used it to prepare eye drops or boiled in wine to relieve the liver. From the XVI th century, the essence of wild plants is distilled in the South. At the outbreak of the Great Plague in Provence (1720), made ​​into fumigations. In the XIX th century, lavender attracted perfumers and fragrance found in soaps, detergents, etc. But this is neglected for synthetic flavors or for the lavender, the perfume less subtle, but less expensive. Today we rediscover the very large lavender lady virtues, which continues to color the landscapes of Provence. Lavender're not an aphrodisiac plant. However, since ancient times, it is associated with romantic relationships: Roman prostitutes dabbed lavender oil body. Unrepentant seducer, Casanova perfumed by its gallant tickets which, it seems, put in "good intentions" recipients. There were no fewer than 300 components in lavender. This wealth gives it many properties. Lavender is a good antiseptic respiratory tract. Inhalations - a handful of flowers in a bowl of hot water - relieve sore throats, bronchitis, flu and feverish conditions, coughs and other sinusitis. Externally, it soothes and aids healing of minor burns, cuts and various abrasions and insect bites: lavender pickers few ears rubbed on their skin in case of bee stings. Lavender has a sedative effect on the nervous system. In infusion after dinner you will find it easier to sleep: take a pinch of lavender in a cup of boiling water and let steep for 10 minutes covered. Lavender is very familiar to but is often confused with the lavender. There are many hybrids: all are grown in the same way but for the health and beauty treatments, choose the L avandula angustifolia or L avandula latifolia (asp). 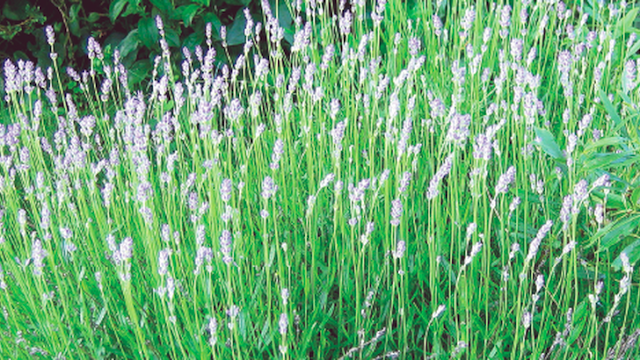 Lavender likes to have dry feet and likes stony limestone soil. Conversely, a humid or too much watering can rot the. Rather rustic, it supports temperatures from -5 ° C to -15 ° C, depending on the circumstances, and can live for many years. Generous plant, it also agreed to push city on balconies and in pots. Sow indoors in January or February, and transplant in March or April and transplant outdoors in May. It is very easy to multiply by lavender woody cuttings in autumn and young shoots in spring or by bursts of young tufts. This Mediterranean requires full sun. Therefore you will plant in the sunniest corner of your garden; its fragrance will be even more pronounced. You cut lavender in the spring just after flowering to keep it a dense form and much expanded (if not, it will take a lanky fast pace and sometimes impressive scale). Please do not prune in autumn while approaching cold: freezing seriously damages the young shoots that form soon after pruning. Pour 100 g of flowers and lavender leaves in 1 liter of cold water. Bring gently to the boil. Stop the heat and cover. Let steep until completely cooled. Filter then spray on pure aphid colonies or passages of ants do not like the smell. Fill a clear glass jar of lavender flowers loosely. Pour oil to cover the flowers. Allow 4 to 5 days in the sun, then filter. Put new flowers macerated for the same time before even filter, so you can renew up to 5 times the flowers for a very fragrant oil and loaded the active ingredients of lavender. Pour into small bottles and keep them in the shade. The infused oil of lavender, antibacterial, relieves headaches: you use it to dry eczema and moisturizing massage relaxant after a day of gardening, or sports. Essential ! The principle of the recipe is the same as the previous except substituting the oil by the cider vinegar. Thus a toilet vinegar, very useful against acne. Note: The ideal time to harvest flowers is the beginning of flowering, when they just begin to open: their scent is at its pinnacle. However, you can make your crop during flowering. Historically, the leaves and lavender flowers that fall under both the salty sweet dishes. Think of it as spices for a game to accompany roast chicken or goat cheese! But stay strong fragrance sparingly because it tends to drive all other tastes. Traditionally, lavender scented olive oil your grill. It is used gladly in dairy desserts (ice cream, creme brulee), after brewing its flowers in milk (at 5 grams of milk 20cl). And goes well with the taste of peaches and apricots associated with lavender honey. Finally, it brightens your drinks, whether syrups or of spirits.